Sukhoi Su 27 fighter jets of the Russkiye Vityazi [Russian Knights] aerobatic display team perform during a demonstration flight at the 2015 MAKS International Aviation and Space Salon in the town of Zhukovsky, Moscow region, August 29, 2015. In April, the Russian Knights aerobatics team celebrates its 25th anniversary. The world's only unit to perform aerobatic maneuvers in Su-27 heavy bombers headlines air shows around the globe. Enjoy these videos of some of the Russian aces' most incredible stunts. Nowadays, this stunt is mainly performed at aerobatics competitions, but during World War II, the barrel was often used by pilots to evade pursuit. While performing the stunt, the plane rotates 360 degrees around its horizontal axis. The Knights perform this stunt simultaneously in several planes, most frequently in diamond formation or in a pair while flying toward each other. In this case, the distance between the aircraft may be as little as one to three meters. This maneuver is also known as the loop. It received its name in honor of the stunt's inventor Pyotr Nesterov, who performed the first loop more than 100 years ago, in 1913. 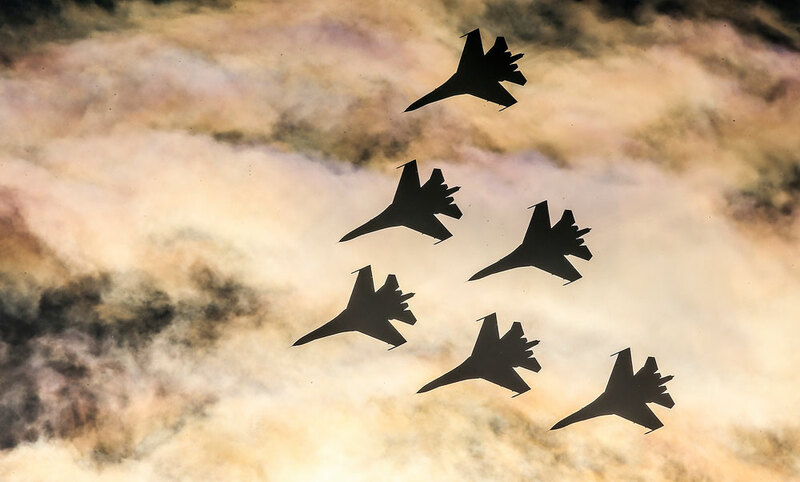 Today, the Russian Knights show this stunt not only as performed by a single plane, but also in formations of up to six aircraft. This stunt is an example of not only the precision work of the pilots, but also of trust and understanding between the team members. The maneuver is performed by a pair of planes, one of which is flying on its back parallel to another, creating an optical mirror effect. This is one of the classic single aerobatic maneuvers, which Russian pilots “decorate” for the show by releasing smoke. Originally, the Bell was regarded as a maneuver in which the fighter becomes invisible to radar-guided missiles. During the stunt, the plane lifts its nose up at zero speed, then drops it down, simulating the movement of a bell's tongue (hence the name of the maneuver). This maneuver is one of the Russian aces' trademark stunts. The Knights first drew the Angel in the sky for their 22nd anniversary in 2013. Within six seconds, four SU-27 fighters released heat flares with perfect precision and sent their smoke trail in the right direction, leaving a huge angel floating in the sky, as if watching what was happening on the ground.